For our complete schedule for the month of April, see our Calendar of events (PDF). Saturday, April 6 "Oasis Clean and Green" Come to the Oasis at 10:00 am to help us prepare the Community Garden for the Growing Season. If you would like to grow food for yourself and the community, contact the church. Sunday, April 14 Palm Sunday with our LSEA Partners. Combined Worship at Humboldt Park United Methodist Church at 10:30 am, followed by a Rally for Housing Equity at the Emmett Street Parking Lot (starting at 12:30 pm). Easter Sunday, April 21 Join us at the Oasis, 3413 W. Medill, for an Easter egg hunt and continental breakfast at 9:30 am, followed by Easter Worship at 10:30 am. 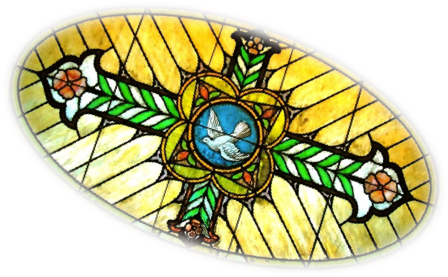 Sunday, April 24 @ 11 am Join us at 1st Lutheran Church, for 'Sunday Dinner' prior to our worship service which begins at 12:00 pm. READ ABOUT ALL OF OUR ACTIVITIES HERE. Along with the Nuestra Señora De Las Americas congregation, we express our worship of God through music, praise, Scripture, responses, prayer, and weekly celebration of the Eucharist. Our worship style reflects our diverse cultural traditions. Songs are sung in Spanish, English or both. The sermon is usually in English, but a summary is provided in Spanish. The first Sunday of the month is designed to engage children and youth. Occasionally, we "make our own Sunday" where members use their wisdom, talents and gifts to encourage one another. As we transition to our new location at 1st Lutheran, we're expanding 'Godly Play' and our youth program. 'Godly Play' is a unique Montessori-based approach to teach children (K - 6th Grade) spiritual truth. Youth in grades 7 and up have their own age appropriate faith formation discussions. See the home page each week for updates. Once a month, we prepare and serve a Sunday Dinner to anyone in the community that is hungry. We serve the meal at First Lutheran Church, 3500 W. Fullerton Ave., starting at 11:00 am. Our worship service begins at 12:00 pm following the meal in the church sanctuary. This prayer circle meets in a member's home. Contact the church for details. Using a variety of spiritual practices such as Lectio Divina, guided meditation, and our labyrinth, this group supports one another to experience spiritual growth and mental health.